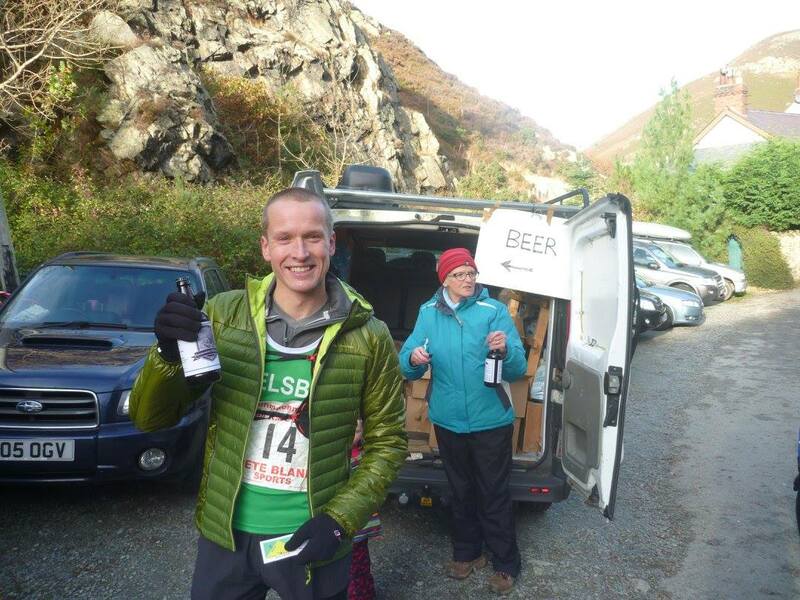 Saturday was the 41st Penmaenmawr Fell Race the last in our Fell club counter series, 10 miles and 600m of climbing. From the small village of Capelulo with its village hall and Fairy Glen Pub and organised by local runner Chris Near. The drive out there was spectacular marking the start of winter finally, cold, gale force winds but sunshine, blue sky and a considerable snow covering on the Carnedds. The sea along the A55 coast line wild and threatening. The race was pre-entry with a limit of 250 due to the narrow lanes and limited parking. Just under 200 muffled up runners were on the start line at 10:30 am, the other 50 were probably sensibly still snuggled up at home! The first incline warmed us up but most still chose to wear their waterproof tops all the way around. The going was surprisingly pleasant with mainly wide sheep nibbled grassy paths to the first check point at the Penmaenmawr Quarry. Then down into the notoriously boggy area cutting across to high surfaced road above Rowen, where we were greeted by Joe and Mario and the usual loud cheers + a flask of hot coffee (which I didn’t stop for as by then I was running with a local lady who was keeping a steady pace and knew the way). A high level undulating traverse with lovely views down to the Conwy valley but straight into the jaws of the wind, before a final steep descent back into Capelulo. A bottle of local beer for all finishers. Saddleworth Runners turn up every year to take part in this race and raise funds for charity. This year they had a large boiling urn full of hotdogs which at first seemed to be selling slowly. The tea and homemade biscuits in the village hall doing much better. Plus the pub was serving free soup and rolls and was cosy and warm and packed with thirsty beer drinkers. This race was getting better and better! We were all called out of the pub and back to the village hall by Chris for the lively presentation and suddenly the sale of hot dogs hit the roof – I wonder why! A course record and lot’s of fast ladies from the Hunters Hill Boggers (HBT) who had travelled down all the way from Edinburgh for a girlie weekend in Wales!! 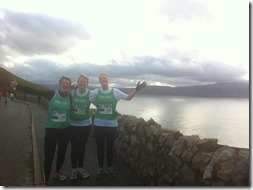 A good green vests turout and some good running by all! Steve and the winner Loving his matching gloves! The overnight cold snap and fierce winds made for a great journey to the race – Snow covered peaks of the Carneddau and some serious 6 foot rollers out on the coast framed what was going to be a spectacular day. In a day that made even the most committed short wearer consider full length tights or pedal pushers for the ladies, there was a slightly more tense atmosphere than usual at the start. The best news of all though was that visibility was clear, so on a course which has so many dramatic vistas we knew we were in for a treat. The race itself is starts with a tough ascent which then keeps on giving as it heads out to reveal the coast and Anglesey. As we started to level out Drum and Foel Fras came into view in all their splendid snow covered glory. I was not alone in my inadvertent out aloud “Wow” as we levelled out and I got a chance to look up. From the North West corner of the course the race turns south over the bogs which were remarkably kind this year, though energy sapping all the same. Coming back around to the finish there are several miles of undulating trails alongside a fantastic dry stone wall. There was snow cover in places and really gave a fantastic finish to the Felsby series. The view of the Clwydians turns into a the gentle sweeping blades of the offshore windfarm; something I always find relaxing. The descent proved as hairy as ever into the finish. Plenty of battles out there between the Felsby contingent, but none so close as Tim and Laura – Laura showing no mercy on the descent and almost snaking Tim on the line. The results show the same time, but after a photo finish the spoils were given to Tim. In usual tradition of these reports I must just point out the cost vs reward equation: £6.50 bought every entrant a jaw dropping course, genuine personal challenge and a true sense of freedom; in addition we all got a bottle of real ale, soup and a roll. Pretty damn tough to beat I reckon. Results wise it was Ben Fletcher put on a master class to be first home for Helsby in 1:21:51 and 20th place overall & 10th in age group. He was followed by CBH (1:27:42 – 27th) and Phil Roberts (1:30:38 – 39th). In the Ladies Laura B-H (1:39:53 – 11th lady in cat) was back first followed by Jackie Keasley (2:04:11 & 9th in Cat). Then a hop skip and a jump followed via Llandudno for the evening to the final road race counter of the season in Conwy – the popular Conwy Half organised by Run Wales. The 9:15 fun run for kids was ran in a deluge and would maybe have put kids off running for life. However with 15mins to go the rain stopped and the sun started to come out. A number of starters were cold and drenched on the line but at least it cleared up for the start. Starting under spectacular backdrop of the castle, across the bridge to Deganwy through some major puddles and onto the soggy beach path to West Beach LLandudno, across to East beach and the start ofthe long drag around the great Orme on the narrow road above the cliffs before returning from West Beach the same way. 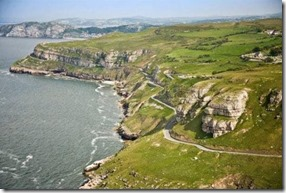 Miles 7 to 9 along the Orme road with time to stop for a photo! An impressive sub 1:30 for Neil and very close for Ian. Well done everyone and especially to David Wiggins on his comeback to halves after a 25 year break and to Chris who has been injured. 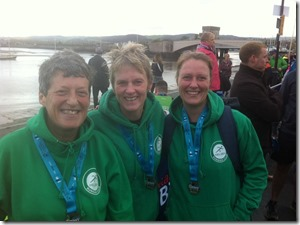 A PB for Tanya and well done to Jo who though she would not do another half again! The three of us ran around together and got plenty of come on Helsby cheers, but the best one was come on “3 peas in a pod”, as Shan says “if it had been raining we’d have been mushy peas”! Start – note the two father and son combinations! Still smiling at the finish! The men were 6th on the day and the ladies 7th. The next race is at Town Park, Runcorn. As it’s local let’s try and get a good turn out for this! 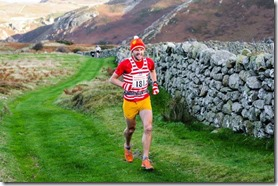 Tim Palmer has sent in the following report for the Arnside Knott Fell Race, over to Tim…. As my part of the multitude of Helsby runners running two races in the weekend, Jenny and I were the Green Army representatives at the Arnside Knott Fell Race (BS). This is a lovely little fell race up Arnside Knott which overlooks the Kent estuary and Morecambe Way. It has a fairly unusual feature of a fell race; in that you go down almost to sea level (the wet-side of a seawall) twice in the race. The views were stunning across the estuary into the Lakes, the cakes were excellent (as usual), the weather was excellent,…what more can you want…? Worth saying that the prize for the best ‘double’ of the weekend must go to Jackie with Penmaenmawr Fell Race followed by Conwy Half Marathon (I make that 23.5 miles with 2,500 ft of climbing). Also, Ben did the double of Pen fell race followed by XC. HCSC’s Christmas Party on Saturday 5th December. Message from the club exec. Please note that this is TICKET ONLY and furthermore that numbers need to be confirmed with the outside caterer, no later than Tuesday 1st December. Can I once again ask all sections to promote this to your members, via email, text and whatever Social Media groups that you utilise (poster attached for you to circulate and display in your own areas). I’ll contact everyone again on Monday-week for final numbers so each sporting section please try to drum up some support please and confirm numbers? Coming together socially to support the club on the 5th is surely a step in the right direction and avoid the threat of the club closing? If folks can go please let me know, I know its between the clubs night out in Chester and a Border League race but if you can support it please let me know. jackiekeasley@btinternet.com Unfortunately I’m away on hols so can’t make it, if anyone can offer to co-ordinate tickets I would be very grateful. The Sandstone Trail Challenge will open for entries on 1 December. If you want to run 33 miles on Saturday 7 May 2016 then this is the event for you! This year all the places for runners had gone by the end of December, so you need to get your entry in asap. Any finally, in the running clubs attempt at using the club more we have decided to open up our Xmas Handicap on Wed 23rd Dec to all sections and hope to fill the lounge. Chris Igoe has kindly volunteered to follow it all up with a Xmas disco. It’s the night before Xmas eve so hopefully you can make it. 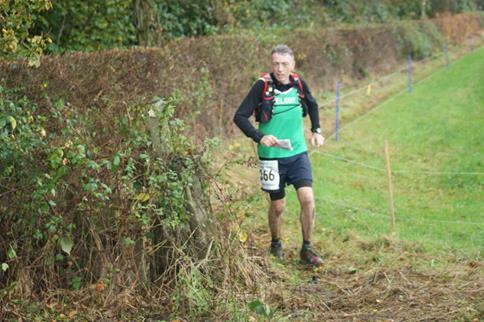 On Sunday 15/11/15 I ran in the inauugral ‘Combe Crawler’ hosted by Ilfracombe Running Club in North Devon. 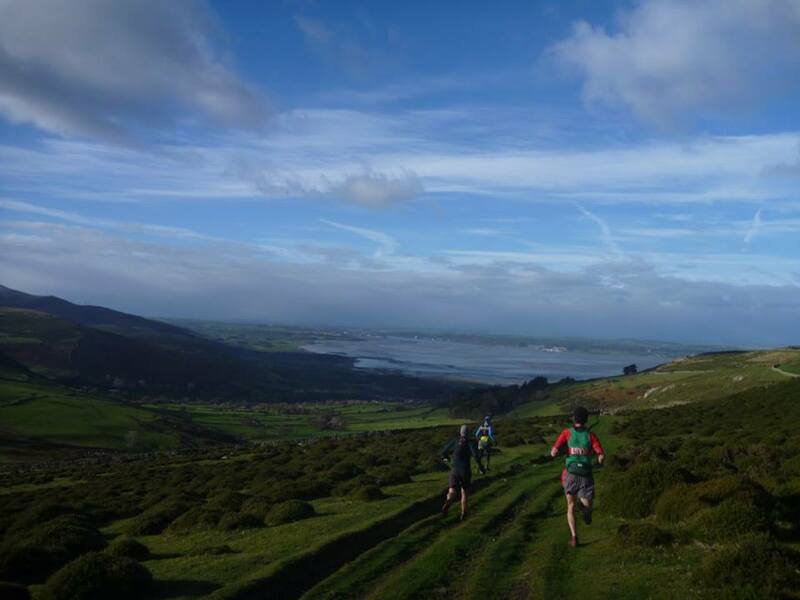 This race starts and finishes at Marlborough Park, the ground of Ifracombe FC, and is eight and half miles with some tough climbs and stunning views of the Devon coast. Conditions were blustery and there had been lots of rainfall prior to the race day making it tough going in parts with lots of mud. The race is mostly off road but there are a few bits of tarmac running and good runnable trails before going through the grounds of Watermouth Castle and along the coast of Watermouth Cove. There is then a further few hundred yards of fast road running as you drop down into Hele Bay and then back into the trails as you climb Hillsboro. A fast descent of Hillsboro is followed by the final tough climb on tarmac back up to the football club. The event was really well hosted by Ifracombe Running Club who only got together as club a couple of years a go. They are a very friendly and inclusive club and trained regularly with them whilst working in the area earlier this year. They have training runs every Thursday night from the football club at 7pm. So if your in the area just turn up for a training run. You’re sure to get a good welcome and be treated to some great running routes. … Great work Jim! Nice to see you keeping the green army flag flying around the country. Some excellent performances and come back kings this week in the Park Run. Gareth Boyd showing some class in Delamere, Jo Lacking swooping 2nd, the Mighty Gaskill back at it too. It’s all in the link below, so read it and weep! Wise Men buy their Xmas cards early! I hope you guys don’t mind and I would be the first to say it’s a little early, but if you are interested in purchasing some Christmas cards please read on. All proceeds go to the Rare Dementia Support fund as we have a sponsor for the printing and production costs this year. At £6 per pack you would be helping a small but wonderful charity which is a lifeline to a growing number of people and families. 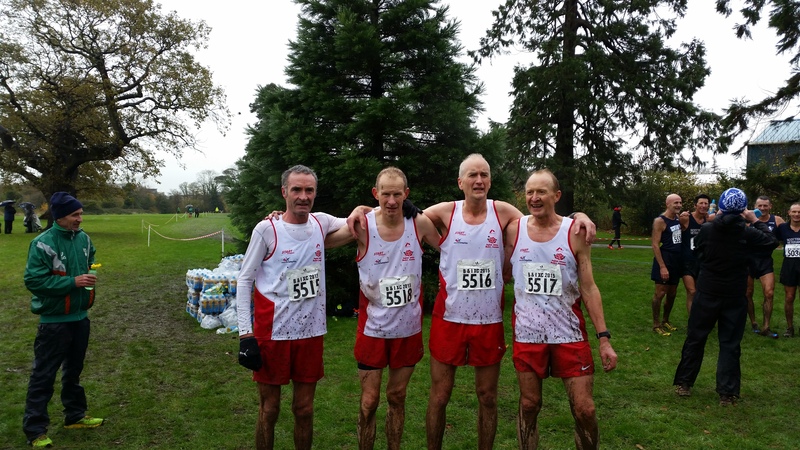 News just in that our England international Colin Bishop won a team silver medal for his age group at the British & Irish Masters XC in Dublin on Saturday! A huge well done to Colin for his epic achievement, be sure to congratulate him when you see him next. A brief report has been sent in by Colin, please see below. “As some of you may know I was privileged to be selected to participate in the British and Irish Masters at the weekend in Dublin. 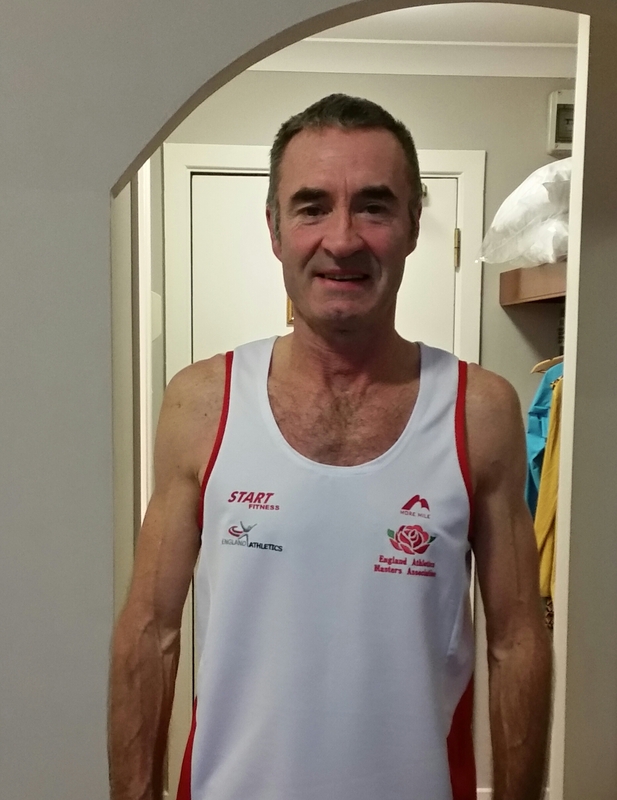 I was immensely proud to put in my England vest on a very wet November afternoon. The class of runners was second to none. 4 Laps around Santry park made up a 8k course, which had already seen womens over 35 churn up the course. It has been noticed that the Wednesday night running groups aren’t quite working out the way they should be and there is some confusion about routes etc. therefore we have decided to have a refresher of the groups. We are asking for some volunteers to be a group leader, you will need to hold a sign before the run and make sure nobody in your group gets lost, muster at various points and make sure nobody gets left behind for safety reasons. I think this worked really well in the summer as new runners found it easy to decide who to run with and nobody was left on their own. I think we have lost a bit of momentum without enough volunteers to hold up signs in the car park. If those on the list also help dig out the signs, if they are down first on a Wednesday, it then spreads the load amongst the club rather than relying on just a few. During the winter Wednesday night runs we will try and alternate through the Frodsham, Ince/Elton & Mickle Trafford routes. However when the weather is foul we will sometimes switch to Frodsham as it’s safer and slightly more pleasant. The route will be announced each week at 6:30pm and again for safety reasons it would be much appreciated if runners keep to these routes so that we know where people are if there is a problem. If a smaller group wants to go to Frodsham that’s fine, but please let Jane, Colin, Jackie or Joe know. If you could please wear high viz clothing for all runs and a lightweight head torch is always handy. We have high viz vests at the club if you need one, just ask at the start. The last Wed of each month is normally the Mickle Trafford 6k or 10k time trail which Colin will inform runners of in advance. There is the torch lit hill option too of course! If you wish to be a group leader then please let myself (col808@hotmail.com) Jane Ashbrook (janebetts@gmail.com) or Jackie Keasley (jackiekeasley@btinternet.com) know and we will try to get this sorted out for our club run on Wednesday. Alternatively you could let us know on our Facebook page. Thanks for reading and if you have any questions please get in touch. Welcome to this weeks round-up. Thank you to everyone who sent a report in this week, as always it’s very much appreciated so please keep them coming. The email address is helsby-race-reports@outlook.com. Just a quick report from the LDWA Kilburn Kanter event in North Yorkshire. 24 miles, 3850 foot of climb. I woke on Saturday morning to the rain beating on the windows. As I drove from York to Kilburn (home of the famous White Horse) the rain got worse. The organisers had to abandon the plan to park on a field because we would never have got on, or off again afterwards. Tea and toast at the start, and then we were off. I had wanted to beat last year’s time of 5.48, but had to abandon any plans to run to a time as soon as we started – grassy paths were ankle deep in mud, stony paths had become streams and the roads were rivers. Last year was dry underfoot, this year it felt like two steps forward and one slide backwards. At one point an uphill footpath was only passable by using the adjacent fence to pull myself up, my feet sliding along behind. As soon as we gained height the mist closed in, making navigation occasionally a challenge. The rain continued to come down as I passed through several cute villages, plenty of farms and the odd moor, until it suddenly cleared as I climbed up Sutton Bank to the last checkpoint. The last three miles was a warm and sunny delight, apart from the squelch of wet clothes and trainers. The food at the finish was as welcome as ever. Numbers seemed a bit down this year, despite the event being sold out – LDWA events are ridiculously cheap, but I guess the downside of that is that entrants can easily decide not to bother if the weather’s bad. Oh, and my time? 5.21. Smashed it. Ed: great stuff Ben, you just keep getting better. Hard training is paying off this year! Also on Saturday was the inaugural Warrington Way 40m ultra excellently organised by Lymm Runners. Helsby were represented by Jim and Jackie. Over to Jackie … As is usual with ultra events, a few months back it seemed a good idea to enter this race. As I’ve now completed 3 ultras this year each being just over 30 miles with hills, was a 40 flatish miles possible? Also having lived in Warrington in the past it seemed a fitting idea to run around it! Bill and my friend Jennie who lives Lymm were recruited for support and B&B the night before and to supply the usual hot drinks and extra carbos along the way. The circular route certainly took in the ”sites” of Warrington; parts of the Trans Pennine Way, enough cow and crop fields for life, brown field sites, canal paths, cow slurry farm tracks, the humming of traffic alongside and across motorways and A roads plus even a power station (Fidders Ferry). Taking in Warburton, Birchwood, Croft, Burtonwood, Widnes, Sankey Valley, Moore, Walton, Hatton to name a few places en-route. A 7am start in the dark and pouring rain with water running inches deep down the cobbles followed by a murky splash down the trans-pennine route started us off. It gradually lightened up by about 9 am, but the rain and heavy showers continued all morning before amazingly the sun came out early afternoon before the odd shower later on. There were well organised check points after each 10 miles, with lots of support, drinks, jelly beans and other childhood favourite sweets and biscuits. Support along the way from Warrington folks and runners was really good and encouraging. 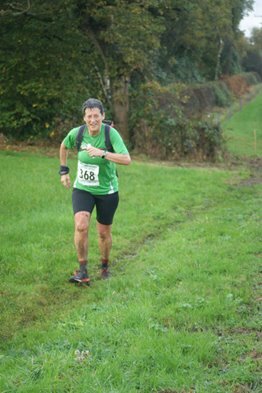 The solo entries were limited to about 100 but there were also 20 relay teams (4 legs of 10 miles) so it wasn’t too lonesome out on the course!. 4 waterproof maps with instructions were issued at the event, so you really had to navigate around, although green and white tape has been put at intervals along the route (but as usual there were many gaps so could not be relied on!). I reccied the last 12 miles from Moore the week before in case I was too tired to read the instructions and map plus I though I could well be doing this section in the dark. Surprise surprise, I managed to keep a steady pace up and keep running most of the way, apart from the really glooopy sticky parts! In one way doing a flat race was more difficult, physically and certainly mentally, as there were less breaks and variations in stride, plus the mountainous views to take your mind off the running were certainly missing! The continuous flat really does take it out of your legs, the loading on the hips and knees is much less than the fells but the intensity on your leg muscles is intense, so several days later I still have a swaggering walk! Charlie Sharpe finished 1st in a staggering 4:51, 1st lady also from Spectrum Striders was Shirley Anderson in 6:23, Jim came in an excellent 36th in 7:47 and I game in mid afternoon (i.e. 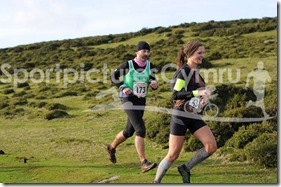 in daylight) in 45th in 8:19, so more than half way up the field which I was delighted about! 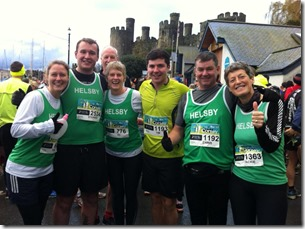 Four Helsby runners braved the elements on Saturday to participate in the Arley 10k. Wellingtons optional and a warning email the night before about the state of the registration and toilet area forewarned us it was going to be a wet one. On the whole it was a warm but blustery race on the familiar, slight undulating roads around Arley. Always an enjoyable but hard race as everyone put everything they could muster into their run. A few pitstops for some added unintentional minutes to the final timings, but couldn’t be helped. An amazing run from Jo Lacking saw her finish 9th female. As always a very well organised race with fantastic marshals. All did the green army proud. 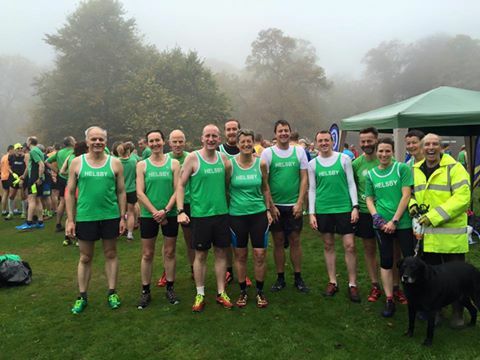 It was excellent to see a full team out for both the mens and ladies team for the borders league on Sunday, especially since we had a clash with an XC on the same day and a few injuries within the squad. Although both teams finished bottom of division 1 the important thing is to get a full team out as we are not too far behind at the moment so we can always claw back some points over the season. Fitzy lead the charge for the men storming around to finish first for the Helsby men and Jo Lacking is showing some superb form to take the chequered flag for the ladies. We also had a couple of category podiums which can be seen in the results below. Well done everyone! Lets hope we can keep getting a big turn out at each race as we have a great strength in numbers in our club which will pay off later in the season, I’m sure Fitzy and Vanessa will be rallying the troops soon for the next one. Also thank you to Joe and Mario for their support on the day, it really gives our runners a spring in their step when they hear Joe shouting his words of encouragement! Great results which put the ladies team into 3rd place on the day and the men were 6th. Don’t forget the next one is on 22nd November at Beacon Park, Skelmersdale. Please find the results for the Saturday parkruns. Well done to all who took part, some great results! 7.30pm Helter Skelter, I’ll send a few more reminders nearer the time. That’s all this week. Thanks once again for the reports and keep on running! Various factors have contributed to the lateness of the blog this week. Apologies. 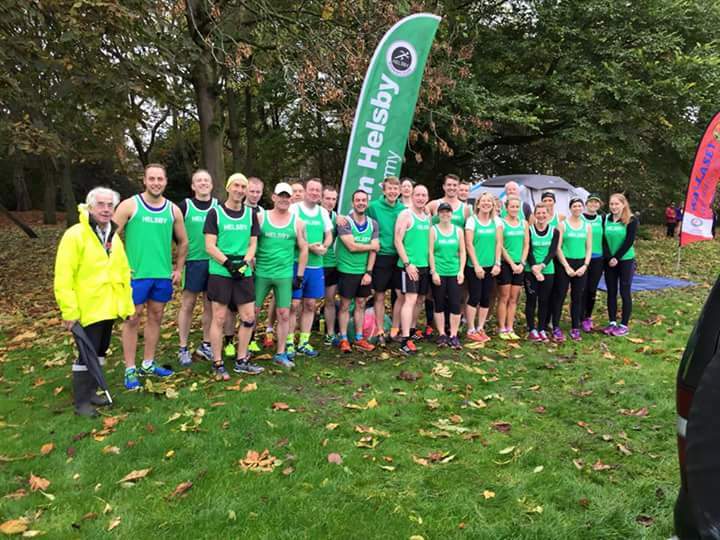 Helsby runners were in action at Delamere, Ellesmere Port, Warrington and Widnes parkruns. Full club results can be found below. Next up is the much anticipated (especially by Degsy Morris for reasons that are best left unsaid!) Norton Priory 5 mile race. It was an excellent turn out by the Helsby crew, Rachael Holden has kindly included Dereks report in her own, ever so slightly better one, below. The Norton Priory 5 Mile road race is a fast and flat run over a single loop on traffic managed roads. Starting and finishing at the historic Norton Priory Museum and Walled Gardens. The route takes in the surrounding areas on road and paths. Having trained on the route for the past 4 weeks, thanks to Roy and Joanne and improving my running times each week, I woke up feeling quite nervous on the morning of the race, but once meeting up with everyone we all seemed to feel the same which actually settled my nerves. All 10 of the Green army met up and we all started off together at the front of the race line. Weather conditions were foggy but not too cold for an early morning run. As the race started I soon realised this was going to be a fast paced race. I managed to keep Michael, Adele and Roy in my sight for the first mile but Colin, Derek, Joanne, John and Ian where soon off on a super speedy pace and well out of sight before leaving Tudor road. The route was very well marshalled and had a very good atmosphere. I had a lovely friendly man who was about 7 foot tall and looked like a body builder tagged onto me for the first 2 miles and within those 2 miles I felt I had known him my whole life! (haha) He then left me to talk to a few men just in front to which I have to say I was secretly glad about as anyone who has ran with me at my fast pace will know the best response they will get is a high pitched ‘yes or no’…. The course is a really nice 5 mile route which is mainly flat with a few inclines and I nice little hill towards the end which I think surprised us all!! I for one am glad the Norton Priory run has been such a success as without all the training Roy arranged, I certainly wouldn’t have got my PB and I think I speak for everyone in saying this, so big thank you to Roy. 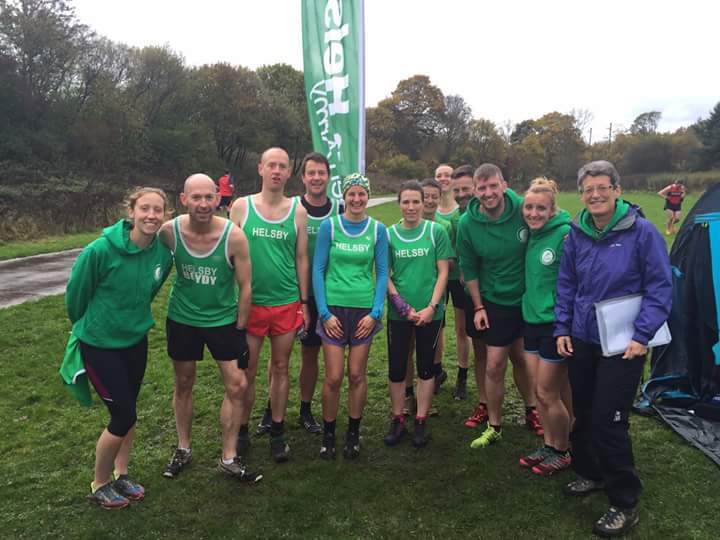 Saturday saw the Green Army at Clarke Gardens for the opening Liverpool and District Cross Country League. Darren O’Connor sent in this report. A crisp and foggy morning greeted the large crowd of runners at Clarke Gardens for the opening Sunday race of the Sunday x country season. A decent number of Helsby mob (11 I think) took to the starting line to tackle the 5 mile race. The course consisted of 2 and half laps which included grass, woods, rolling hills, tree stumps and most of all mud! It was a tough run and I was surprised to see a few club runners pull out along the way (none from the green army though!!) I like to think the shouts of encouragement from Joe and Mario from random places helped get the team round! The results were not out at the time of writing but I know Fitzy romped home first for Helsby despite being on the all inclusive on his jollies all week! Being my first ever attempt at x country I didn’t know what to expect but glad I tried it out. It was slippy and the muddy patches busted my legs but it was really fun and a nice change from the roads. I will definitely be doing more of these and would advise everyone to give it a go! If nothing else it’s a good excuse to buy some new cross country spikes and who doesn’t love new runners. The Felsby contingent were in Wales on Saturday in the Clwydian Hills, Jim Jones sent in this report. It was a great turn out for Helsby at Cilcain on Sunday for the Clwydian Hills Fell Race. Nine Helsby vests ran the tough 8 mile+ route with nearly 3000ft of climb in amazingly sunny weather for the 1st day of November. Many people travelling from the Chester area will have been surprised by the stark change of conditions as they drove out of thick fog, into North Wales and glorious sunshine. The conditions made for fantastic views as we ran along the Clwydian Way towards the foot of Moel Arthur and then turned back with a tough climb up Moel Dywyll and into blinding sunlight. That seemed a particularly tough climb knowing that that we still had to drop back down into the valley and then up the infamous gully to Moel Famau. Despite the glorious sunshine there was still plenty of slippy mud to negotiate on the way back down to Cilcain. All in all a good turn out to the Felsby calling. A special well done to Gaz for running his first (of many?) fell race. He did get his road running fix with a brief six mile road run beforehand! 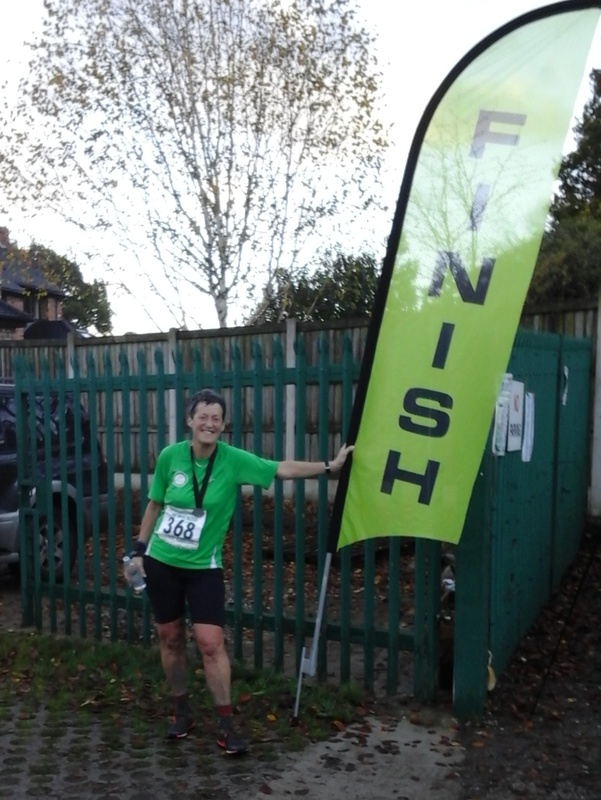 Jane Ashbrook was the Felsby ladies representative – well done Jane! 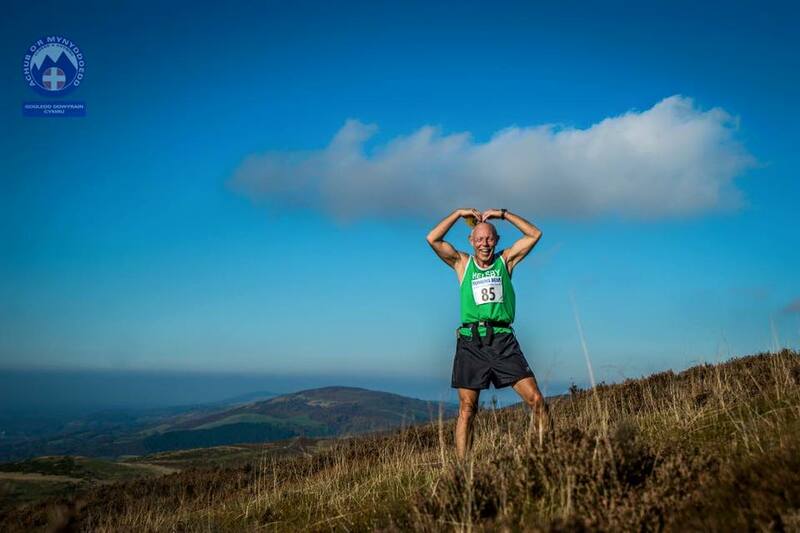 And also praise to photogenic Charlie Roberts for becoming the cover picture of the Clwydian Hills Race and the Helsby FB page – who wouldn’t be convinced by seeing Charlie that fell running is fun? 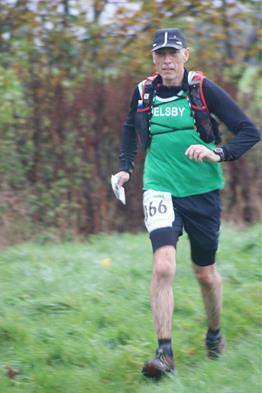 Jim O’Hara was first home for Helsby with a fantastic time of 1:33:17 and 16th overall out of the 149 who finished the race. 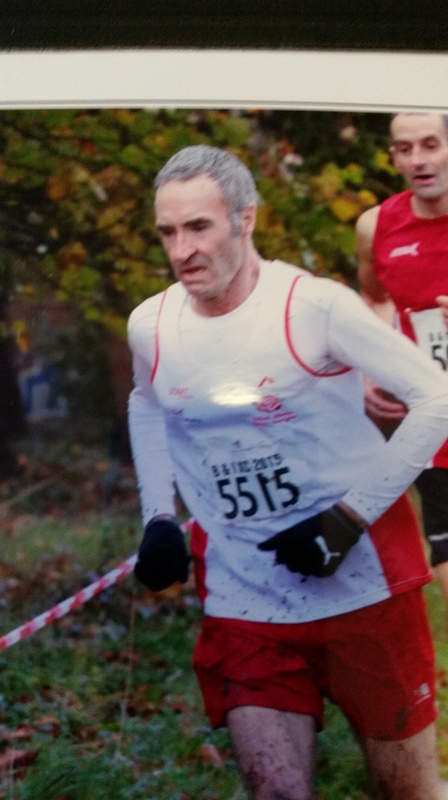 Lastly but certainly not least, Chris Baynham-Hughes’ amazing 100 mile race at the White Rose Ultra. Not only did he complete the distance but he did so finishing in 4th position! Here’s the full report from Chris. Run enough Ultras and DNFs become an occupational hazard. Having started running ultras in 2011 I’ve experienced two, both were attempts to run 105 miles and in both the heat of the race played a huge part. My record with heat is not great. At Transvulcania in 2013 I finished but ended up being given a drip due to excruciating cramps that were running up and down my body in waves, roughly 4 minutes on 1 minute off; I felt ridiculous then and still look back and think the same, but also in the knowledge that it was the best recovery drink I ever had! I’ll make no secret about it, I’ve become a little obsessed about running UTMB following on from my attempt this year. It was the second time I’d attempted to run 100 miles – the first (the Lakeland 100 – actually 105 miles) I chose to stop at 90 miles, a decision I’ve never regretted, why? Well it’s a long story and one I can bore you with on another day , but it involved a week of food poising, unusually hot weather and some extreme chaffing. My second attempt was at UTMB; this time I managed 80 miles before the extreme conditions resulted in heat stroke. I’d be lying if I said that DNF at UTMB hasn’t played on my mind ever since. Determined to enter again and finish, I looked to see if I had enough points to enter again and was aghast to see I was 3 short. Since it took me 3 attempts to get in last time I didn’t want to miss a year to apply, a quick review of UK races between now and the opening of the ballot showed I had one option; the 100 mile White Rose Ultra worth the maximum 4 points. I will confess that I wasn’t keen to run that far, but starting in Golcar near Huddersfield… in November… the heat can’t get me this time right? The WRU100 is made up of a 10 mile start and three 30 mile loops (there is a 30 mile option and a 60 mile option too), Whilst this makes it logistically easy, it is a nasty course psychologically; getting out to start another loop is difficult and is comparable to running the sandstone trail from Whitchurch to Frodsham, turning around and running back, finding your car won’t start so you need to turn back once again to get home…. Oh, but it’s got more hills. As always I set off too fast running with a friend I met at the Highland fling in 2014. Kirk is a great company and a great runner (he has sponsorship from Salomon) so we took it out and ran together for 30 miles before I decided to ease off a touch. I was struggling with my appetite and had packed too much sweet stuff which I now just didn’t fancy. Within a miles of splitting up I missed a sign and added in an extra 3 miles to the course – since there was no map it was a good job I had my phone so I could use the Sat Nav to point me in the right direction! Back on track I panicked as I saw a lone headlamp coming my way – the course is rather convoluted so I feared I’d ended up inadvertently ahead of Kirk, but I hadn’t and it was third place heading towards me. Phew! Getting out on the second lap was easy. I was frustrated by adding the extra miles, but so glad I’d not cheated the course and now I was all business; a quick restock of food and I was off. Second time to the ‘bog of doom!’ (it was easy to get around) I settled into running on my own as the sun came up. The cloud inversion was simply stunning; the chill was lifting to a clear sky and those lovely long shadows you get through autumn – my favourite time of year to be running. The course in the day is beautiful, no, stunning. The tree colours were simply spectacular, bleak moorland shifted to stunning valleys and a real sense of journey; I think the 30 mile version would be a perfect race for those tempted to up their distance to an ultra. Running on my own for long periods on an adventure such as this is a missed opportunity as well as tougher psychologically. I busied myself with music, but that didn’t stop me having a low that lasted roughly 30 miles. My legs were unusually tight and starting to get really sore; many people talk about the “pain” of endurance running, but I’ve never associated it with pain, only fatigue. This time it was pain. The week previous I’d had to drop out of the OMM as I was struggling to walk; a freak issue with my back had left me in so much pain I feared I’d herniated a disc, so just making the start line had been big for me. The stiffness in my lower back eased and I had no issues with it, but it clearly pulled on everything else causing me the issues I had… on my own… wondering why I’m doing this to myself… do I really care?… there’s no shame in stopping… I felt… low. Compounding all this was blistering heat – what is it with me and hot weather for hundred milers? I figured I was safe in Huddersfield in November, but I was getting seriously concerned about salt and sunburn! I finally arrived at the event centre with 70 miles in me. Given my mood I had readjusted my plans (to quickly restock and move on) to have a sit down and a proper meal. I had been forcing food in but was struggling with the sweetness so not as much was going in as I would have liked. Dave Douglas from Delamere Spartans came to my rescue and acted as Geeves. Taking my box of pasta, heating it up and getting me somewhere to eat. I was pathetic. Head down as all the 30 mile people came in, looking like roadkill. I was desperate for sympathy, for acknowledgement, for anything really; nourish my ego, show me compassion, anything to get me going again, but instead I simply cut a desolate figure as I slowly worked my way through my food. Dave was fantastic; himself knackered he offered me words of encouragement, popping back to check on me whilst packing up his own stuff and trying to recover enough from his 30 mile run to go back and enjoy the rest of his birthday. I’ll not forget the support he gave me; Legend. I finally got out, resigning myself to a 30 mile walk and a miserable one at that. I put on some Radio 4 programmes I’d recorded and didn’t feel quite so alone. Two guys caught me up whilst on their 60 and I tagged on, even running a little bit. Come up to the first check point my friend appeared which was a huge mental boost. I knew his house was only a mile away and cracked on around to see him again; upon arriving I had a major wobble. Roughly 78 miles in and I had lost all perspective of why I was doing it. Extreme endurance can strip you bare like nothing else. Emotions often run very high and I was at a crescendo; bursting into tears I sobbed at his gate; I had convinced myself to stop, to give up on it all… there’s no shame in that right? No shame in admitting on my third attempt to crack the 100 mile distance that I just didn’t have it within me? The sobbing stopped. I wiped my eyes and without thinking announced, “Right. Better go and finish this off then”. And that was it. I limped off determined not to stop. No Goubunku. No surrender. As I reached the next flat road section I decided to run; I’d be out for hours otherwise. I got into a rhythm; I counted my steps setting myself mental targets of how many to do before I could walk again… and then beating them. I concentrated on my form, running through proprioceptive cues, trying to be as efficient as possible to less the impact on my body. It felt… well… ok, my spirits started to lift, I got back to running 9 minute miles and overtaking the 60 mile people. What a feeling. The sun started to set, I was back in the hunt, a finish was all I came for, right now I was starting to believe sub 22 hours was possible too. With 15 miles to go I tagged on with two guys only to find a few miles later that one was on the hundred. We worked well together as a three, it seemed wrong not to run when one of the others were so between us we started to chew away at the course. Heading out of Marsden I started running again as soon as we hit the first bit of flat. I promised myself 500 double paces, but as Butterly and Wessenden went by I simply refused to stop, 500 became a 1000, but that would have seen me stop after overtaking another guy on the 60 so I cracked on up to Wessenden Head. Andy (the other guy on the hundred) dug in too. I didn’t want to lose him from a morale point of view, but I had to make the most of this good spell. I simply couldn’t believe that I could run again and at a decent speed ~9-9:30 on a mild trail gradient. These adventures are always a journey of discovery and to go from sobbing and limping ten miles earlier, I was now positive I’d finish and getting stick on Facebook for posting a status rather than concentrating on running (I only posted whilst on a hill walking… honest!) The encouragement from my social circle was a massive boost. It felt like I had the whole of the #GreenArmy behind me and when you start getting stick you know they believe in you… I was believing too. Andy and I stuck together for the final 9 miles. 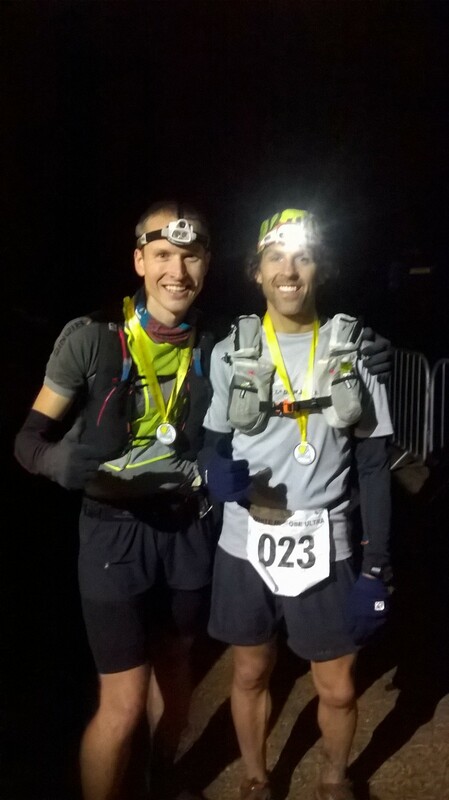 We’d now set our sights on a sub 22 hour finish and it was on, but it was going to be tight. The final 5 miles are a cruel convoluted mixture of tracks that has you feeling like you’re going around in circles. Everything seemed longer and steeper than it was last time around. We ran/ walked our way to the finish finally pulling in around 21:49 ish. It felt wrong to race at that stage and we were both content to share a very surprising 4th place. Mission accomplished. Medal on, quick photo, bags grabbed, I was in the van in under 5 minutes and within 10 minutes of finishing I was in the most fantastic bath I will ever have! Having one of your best friends living on a course is definitely something to factor in when picking an ultra! Just a quick reminder the tomorrow is the 2nd Borders League race at Birkenhead Park, the men in particular could do with a good turn out to avoid getting penalised for not fielding a full team of 10. Please try and make it if you possibly can. I know lots of you use GPS watches and phones to record your runs. If you’ve not heard of it Strava is a brilliant tool for keeping track of your runs and comparing your progress (or lack of!). There’s a bunch of us all sharing routes in Strava club — no more secret training!